Fort Macleod’s senior citizens have a new home. The grand opening of the new $9.065-million Pioneer Lodge culminated Thursday with residents Glenna Moorey and Raymond Chester cutting the ribbon. “We did quite well,” Willow Creek Foundation chair Maryanne Sandberg said of a project that took about 3 1/2 years. Sandberg presided over opening ceremonies before a large crowd of dignitaries and members of the public. Sandberg recounted how plans for a minor upgrade turned into construction of a brand new building when the provincial and federal government delivered unexpected funding. Sandberg praised the Willow Creek Foundation board and staff for their work on the project. The governments of Canada and Alberta provided about $7.2-million with the Willow Creek Foundation funding the remaining 20 per cent. The new Pioneer Lodge is 40,400 sq. ft., more than twice the size of the old lodge, and has 40 rooms including 10 one-bedroom units of about 515 sq. ft. and 30 350 sq. ft. studio style units. Ten units are designated for people requiring supportive living care. Each suite has its own three-piece bathroom, kitchenette area, storage area, and closets. Features of the lodge are that it is barrier-free, has a covered entry, a two-way fireplace in the lobby, and wide hallways to accommodate mobility aids. There is a large dining room with an adjacent outdoor patio, a large multi-purpose room, a cozy library and two other areas for small group activity, hair salon, spa room, administration offices, and a modern kitchen, staff room. There is a storage area for residents’ use, a garage for scooter storage, assigned parking for residents, Cable TV, telephone and Wifi. And indoor walkway connects the lodge to the two Colonel Macleod Manors. Pioneer Park adjacent to the lodge has been restored for residents’ use. “That has been restored beautifully,” Sandberg said. Calgary Shaw MLA Graham Sucha was on hand to represent the minister of seniors and housing. Sucha referred to the $18-million modernization of Fort Macleod’s two schools and construction of the new lodge as important to the community. “This town has such a great family feel to it,” Sucha said, adding the schools and lodge enhance that feeling. Dany Skelling of the Canada Mortgage and Housing Corporation called the lodge opening a great day for local residents. Skelling said the modern lodge provides senior residents with a chance to live independently in a beautiful setting. “Nothing is more important than home,” Skelling said. Foothills MP John Barlow offered congratulations to the Willow Creek Foundation. Barlow said Alberta’s seniors are owed an investment in modern housing as repayment for the work they did building the province. Granum Mayor Helen Kehoe said the lodge is important to her community as a next step in housing for its seniors. Fort Macleod Mayor Brent Feyter said Pioneer Lodge is an important part of life in the community. “This is an amazing accomplishment,” Feyter said. Sandberg, who is also reeve of the MD of Willow Creek, said her council was pleased to be involved. “We recognize the value of this building,” Sandberg said, adding Pioneer Lodge will become a model for other communities. 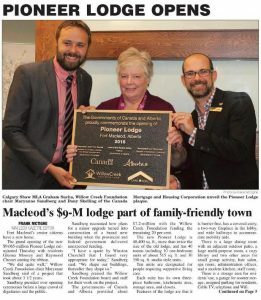 Calgary Shaw MLA Graham Sucha, Willow Creek Foundation chair Maryanne Sandberg and Dany Skelling of the Canada Mortgage and Housing Corporation unveil the Pioneer Lodge plaque. Glenna Moorey and Raymond Chester cut the ribbon Thursday to officially open the new Pioneer Lodge.